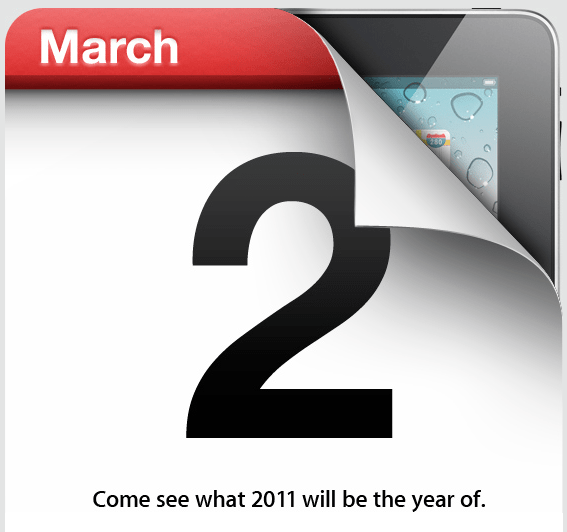 Apple will announce the iPad 2 in San Francisco on March 2nd at 10 A.M. Visit TechHeavy.com on March 2nd to get live updates as the event unfolds! Unlike all of Apple’s previous invites this one seems to get straight to the point with the iPad in the background and the GIANT number 2 staring you right in the face. The event will take place in San Francisco on March 2nd at 10 A.M. We will, of course, be giving a live overview of the event in real-time so check back here on March 2nd to get all details as the event unfolds. The image below is the official invite that was sent out to the media this morning for the next Apple Event.